Hello and happy Friday to everyone! Are you ready for the weekend? I sure am! I've got lots of chores to do, such as splitting and stacking wood, in preparation for winter(which is quickly approaching here, our mountains just got their first dusting of snow!). With the arrival of September Holly has a great challenge for us this week at The Friday Mashup....a back to school project! You can also do a project that has sewing on it OR you can mash it up and do a back to school project that has sewing on it. Here in southcentral Alaska students go back to school in the middle of August but growing up my schools always started after the Labor Day holiday weekend, so for me back to school invokes images of fall, and that's what I went with for my card. I added the "You Inspire Me" sentiment so that way it could be a perfect card for a teacher still! However I was a bad girl and forgot to do any sewing on my card. I got the card finished, went back and looked at the challenge and went "oh crap". Sorry Holly! 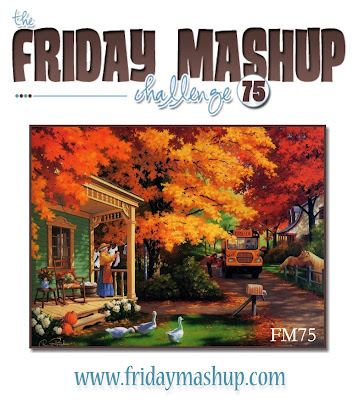 Make sure you head over to the Friday Mashup blog to check out all the great projects from the rest of the design team! Make a "Back to School" themed project. Or Make a project with "Sewing". Or "Mash it Up" and create a "Back to School project with Sewing". Happy Friday to you too! Beautiful and sweet fall card. 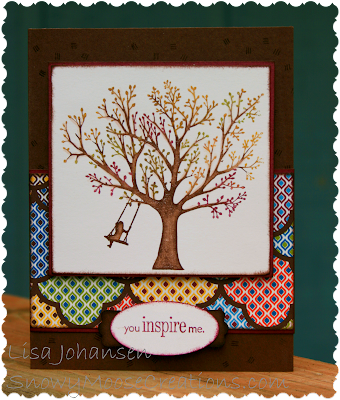 Love the child swinging from the tree. As a child I would swing for hours on our swing set. Any how back to your card I also love the pretty pattern paper. I just love that big fall tree! One thing I miss living down here (besides the snow) is the beauty of fall. That tree of yours is gorgeous!! !